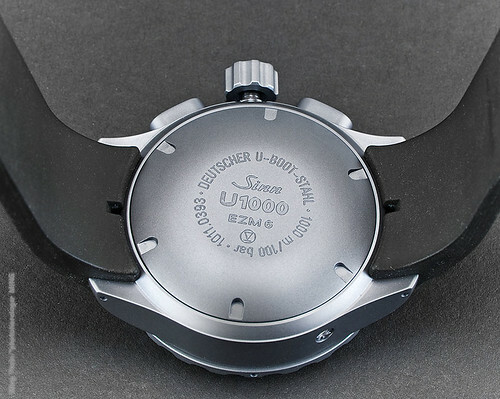 An imposing 44mm across and nearly 20mm thick, the U1000 is built like a submarine – literally. 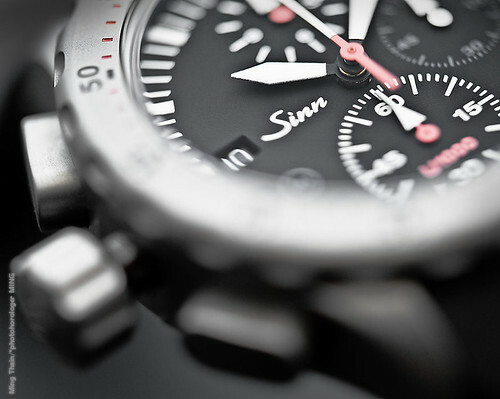 Sinn uses submarine steel – a special alloy also used by the German Navy for its subs – for the case, bezel, crown and pushers. 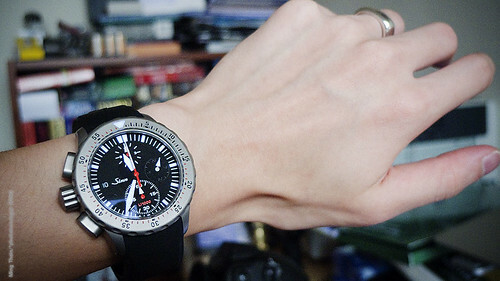 You know that slightly hollow feeling you get when you tap most watches with your fingernail? 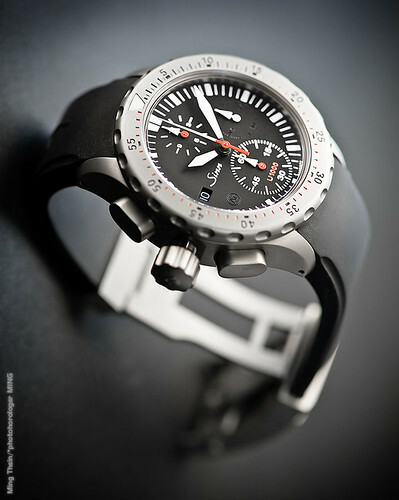 Not a sign of it with the U1000 – it’s as though you’re tapping an anvil. Even if you tap the crystal. That is the U1000 in a nutshell, really. Built to be a reliable, indestructible tool. 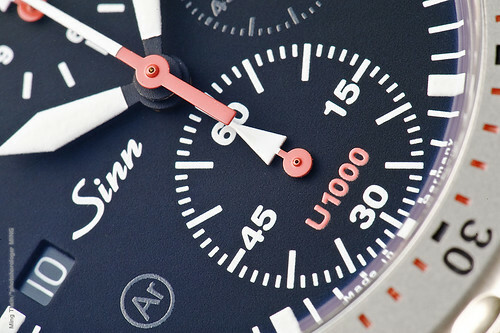 The submarine steel case is water resistant to – you guessed it, 1000 meters – and is so strong and well sealed that it doesn’t require a helium release valve. It’s also Tegimented for additional surface hardness. The chronograph pushers have a special gasket system that allows underwater use, and they’re big enough to activate easily with gloves on. So is the crown, which feels more like the wheel nuts on my car than anything horological. The crystal is 4mm thick, and has a hardened antireflective coating on both sides. 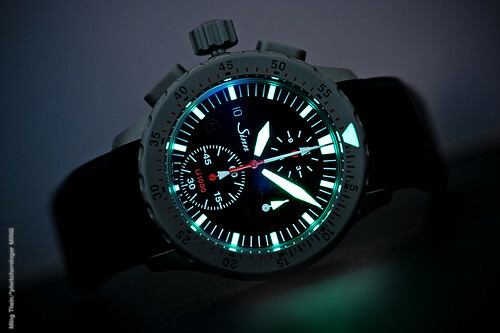 The bezel has a luminous pip at 12, and screws to secure it to the case; it can also be turned (in one direction) only if depressed simultaneously. The case also has argon filling and a copper sulphate drying capsule, if in the unlikely event some moisture somehow gets in. 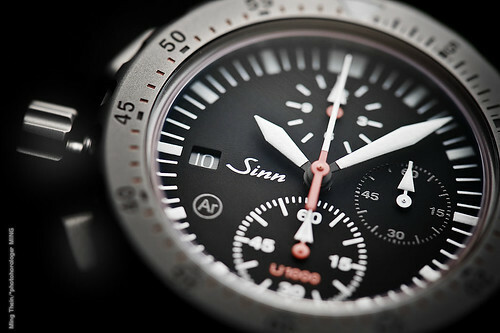 There’s also Sinn’s special oil to keep the movement happy at extreme temperatures. So how does it wear? In a word, large, but not as large as you’d expect. 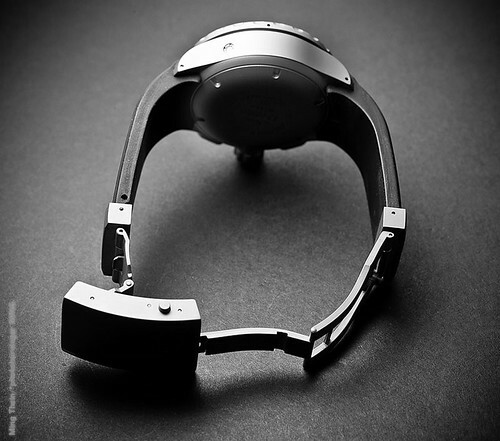 I have small 6.5″ wrists, and I was able to wear the U1000 very comfortably (but you’ll have to cut out all the segments of the rubber strap AND remove the extension link to use the standard large buckle; alternatively, get the butterfly deployant). 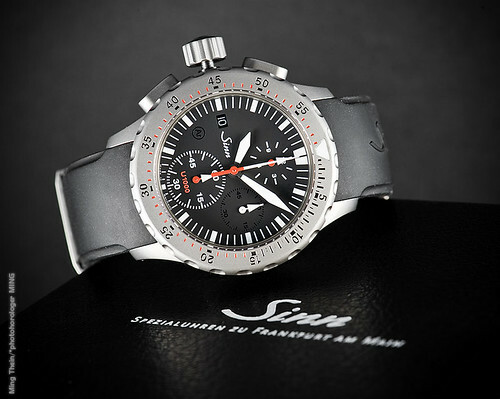 It also hides its bulk well – I think through a mix of well chosen proportions, a largish bezel, and several vertical breaks in the case (hugely domed case back, bezel, slightly domed crystal). It glows like a torch at the slightest provocation, and was always readable – though the modified 60 minute counter could do with a larger scale.